Chick-Lit Author D.D. Marx’s Hot New Release “Beyond Believing” Climbs to #1 on Amazon, in the US and Canada. Contemporary Romance Fiction author D.D. Marx’s trilogy ‘The Beyond Series', is quickly becoming a fan favorite with one reviewer sharing: “A tale of romance that defies the usual parameters, Beyond Believing is a story that will leave the reader eager to pick up the next book in the series.” – Jane Finch, Readers’ Favorite: 5 STARS! Having read the first book in the Beyond series, reading this follow-on (Beyond Love) is like meeting old friends again.A thoroughly enjoyable read which really brought the characters to life. In this dazzling chick-lit series, Marx weaves a journey full of love, laughs, and romance that will tug at your heart strings, keep you guessing and remind you there are never any coincidences. Chick-Lit author D.D. Marx released Book 1: Beyond Believing of The Beyond Series October 17, 2017 and it quickly climbed to #1 on Amazon, in the US and Canada, making her an International Best-Selling Author and Beyond Believing a hot new release. 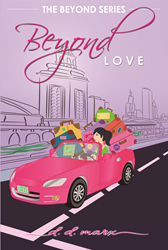 The much-anticipated Book two: Beyond Love is available on November 7, 2017 and Book three: Beyond Forever launching on December 12, 2017. The Beyond Series is available for purchase and/or pre-order on Amazon, and Barnes & Noble. After trusting in her beloved friend Dan’s guidance from above, Olivia is finally on the path to realizing her destiny. Staring at a blank canvas after ditching her raucous corporate life and meeting the love of her life, Finn McDaniels, a hot, widowed, celebrity chef, she is ready to begin anew. When she arrives back home to tie up the loose ends in Chicago, she receives more frightening news further delaying her journey with Finn. Unable to control the outcome, she begins questioning her trust and faith in Dan once again. She distracts herself the only way she knows how by diving head first into a new project. What seemed like a time killer may be the thing that saves her and catapults her into a world she never dreamed of. When Olivia and Finn finally reunite, a deep dark secret is uncovered threatening to ruin the relationship she has waited for her entire life. Olivia is forced to decide whether to tell Finn or let it live in the past forever. Is their relationship strong enough to weather the storm or will it cause them to part ways for good? D.D. Marx is a #1 international best-selling author, contemporary romantic fiction writer, blogger, and a lover of all things social. D.D. is a graduate of the University of Dayton as well as the Second City program in Chicago, where she currently resides. A proud aunt and self-described hopeless romantic, Marx has always had a knack for humorous and engaging storytelling. Her pen name is a dedication to her beloved, departed friend Dan, who continues to guide and inspire her from the beyond in her daily life. The Beyond Series is available to purchase from Author's Website, Amazon, and Barnes & Noble.